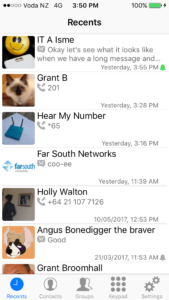 Far South Networks’ new Wanderweb UCaaS application, for iOS and Android smartphones, delivers enterprise-class communications to the small and medium business arena. The extensive transformation under way in the workplace, where employees’ work styles are trending towards the use of multiple devices in and outside the business premises, is supported by Far South Networks’ delivery of the Wanderweb Talk service to its range of IP PBX products. The new Wanderweb mobile app delivers enterprise-class unified communications as a service (UCaaS) facilities to the SME arena. The Wanderweb app is available for both iOS and Android devices, as well as via a standard Web browser, and provides businesses with increased productivity and improved customer service, thanks to higher levels of collaboration. Now business users are able to connect with their clients from any Internet-enabled device from anywhere in the world. Some of the features Wanderweb Talk provides include presence and notification capability, company and personal directory, high-definition voice calling and a messaging facility for individual and group texts.